Differences are all around us. Within those obvious differences are even greater differences that highlight the distinction. For example, an urban setting, like our very own Chicago, is a place filled with variety. A city is filled with students, families, and workers. Although different from one another in shape and sizes, they each hold the same goal: to be able to strive in a big city by discovering beneficial opportunities. Each of them reaches this goal in different ways. A high school student dedicates him or herself to four years of continuous hard work to one day get a scholarship, while a worker dedicates him or herself to years of efficiency to one day gain a higher job position. Like the urban setting example, Zooniverse projects are different from one another in name and subject, but I discovered some projects are related to the same goal: unraveling the origins of our solar system. When researching for my recent Asteroid Zoo blog posts, I noticed similarities between two zooniverse projects called Asteroid Zoo and Disk Detective. In Asteroid Zoo, we looked for asteroids in the night sky from pictures taken by the Catalina Sky Survey. In Disk Detective, we looked for the origins of our solar system by searching for one of two disk types: young stellar objects (YSO) or debris disks. Debris disks are disks of remains from the planet formation process. Asteroids are also remnants of early forming planets. Therefore, debris disks are very similar to asteroid belts but only around other stars. In Asteroid Zoo, users search for individual asteroids, while in DIsk Detective, users search for a collection of asteroids. These disks are important because they indicate that solar systems have formed and the leftover debris is now forming a surrounding disk. Asteroids reveal the components of the early forming solar system. Disk Detective and Asteroid Zoo, although searching for different objects in pictures, want to contribute their own answers to finding the origins of our solar system. What other Zooniverse projects have the same or related goals? Note: On the left is a figure of the asteroid belt in our solar system. On the right is a picture of an identified debris disk from Disk Detective called Fomalhaut taken by the Hubble Space Telescope. Both the asteroid belt and debris disk take on the same circular shape. The two pictures also detail the similar distribution of material inside of them: asteroids grouped together but still leaving space in between them. From research to personal interviews, I also discovered the role that Zooniverse projects Planet Hunters and The Milky Way Project play in finding the origin of solar systems. Like the city residents mentioned before, these two projects move toward this goal in different ways. Planet Hunters searches for planets based on the change in light received from a star. Planet Hunters contributes the discovery of the most popular parts of a solar system: planets. Other planet systems help us understand our own because they can offer information about the formation and aging process about their own systems, which can possibly be translated to our solar system. One of the The Milky Way Project’s goals, as said by Dr. Grace Wolf-Chase, one of the scientists on the project team who I got a chance to speak with, is to find “bubbles”. Bubbles are made from young, hot stars. They indicate a space where stars, like our sun, can still be forming. So each classification in The Milky Way Project helps the science team map out an area of star formation. As stars form so do planetary systems. Because star formation happens at the same time as solar system formation, The Milky Way Project also relates to finding the origins of solar systems. A deeper look into Asteroid Zoo, Disk Detective, Planet Hunters, and The Milky Way Project reveals a connection to the significant goal of finding the origins of our solar system. Within these few Zooniverse projects exist unknown objects and observations ready to sprout. The Zooniverse team helps these ideas come alive by connecting what we already know to what we don’t know. Science communication and education and even research moves forward by using what we already know and building off of it. Each project has its own, unique goal, but the goal for all Zooniverse projects is to help scientists sort their data based on the observations made by users. Come be apart of Zooniverse so you can join in on the fun! The Zooniverse logo and goal . Did you know there are planets that exist outside of our solar system? Believe it, because they are called exoplanets and there are more planets than just Jupiter, Mars or Venus. Citizen Scientists as well as many other organizations have been studying planets that have a lack of information. Scientists want to understand how and where exoplanets form and what they are like. Studying exoplanets are important, because it is a great way to search for life beyond our Earth. Today, I will review the transit method and the Citizen science project called Planet Hunters. Citizen Scientists receive most of their data from NASA when they sent the Kepler spacecraft to space. NASA Kepler mission was launched in 2009 and uses the transit technique to detect exoplanets. The transit method helps detect planets that pass in front of the stars they orbit: planets block out starlight which causes the star to dim for a few hours. Every thirty minutes, the Kepler spacecraft gazes at a northern constellation called the “Cygnus” and records the brightness of certain stars that come to view. The measurements of a star’s brightness over time is a light curve. The Kepler spacecraft records data for more than 150,000 stars which is sent to Earth at regular intervals. The data is then downloaded and added to the rest of the data that is collected about light curves. 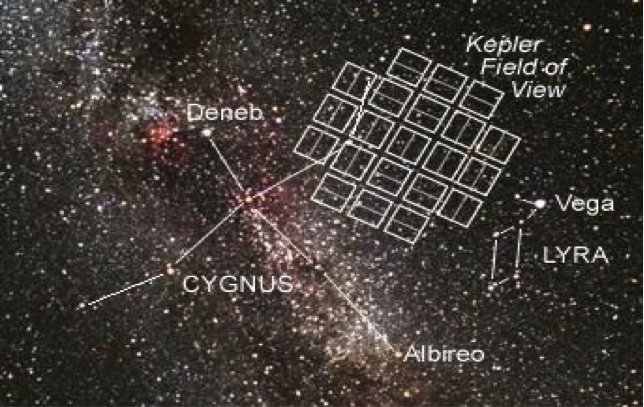 Below is an image of the Kepler spacecraft field of view. Citation: Hunters Team, Planet. The Kepler Public Data. Digital image. Planet Hunters. Zooniverse, n.d. Web. 25 July 2014. <http://www.planethunters.org/science>. How do we analyze the light curves that are sent from space? Well the Kepler team has developed computer algorithms (calculations and problem solving made by a computer), to examine light curve data. The computer programs try to inspect every light curve, but the algorithms do make mistakes. The human brain is very good at detecting patterns and when you put human brains together, scientists can understand the data way better. Being a Planet Hunter is an online experiment that allows humans to find patterns in the light curves shown on the website. Citizen participants as well as the Planet Hunters science team, analyzes the data and helps understand types of light curves and also identify oddities. To help classify the data and find exoplanets, we should look for sharp dips in brightness in the light curve. A dip or transit ( when planets pass in front of their stars ) can occur in a “quiet” or a “variable” light curve. Quiet curves appear more scattered while variable curves appear more wave like. The size of the planet is also reflected in the depth of the transit points. For an example, if a planet is larger, than the dip in the graph would be lower and if the planet is smaller than the dip in the graph will be higher. Below are graphs to help clarify what was stated, showing dips from planets in both variable and quiet curves. Note: This graph shows a quiet light curve without any variability with a transit. Citation: Hunters Team, Planet. Citizen Science. Light Curve graph. Digital image. Exoplanets Yale Astronomy. Yale, n.d. Web. 25 July 2014. <http://exoplanets.astro.yale.edu/science/citizenscience.php>. Note: This graph shows a variable light curve with a wave-like variability with a transit. Citation: Hunters Team, Planet. Citizen Science. Light Curve graph. Digital image. Exoplanets Yale Astronomy. Yale, n.d. Web. 25 July 2014. <http://exoplanets.astro.yale.edu/science/citizenscience.php>. When scientists are detecting planets, finding one transit it is usually not enough, Citizen scientists have to look for repeating transits. The time it takes a planet to complete one orbit is called the orbital period. It can simply mean, counting the number of days from one transit to the next. Planets that are in longer orbital periods, will be more challenging to detect for both humans and computers, because a transit may not appear in every 30-day set of light curve data. The easiest planets to find are large planets that have short orbital periods. Smaller planets with long orbital periods will be more challenging and take longer to detect. It will definitely take time for scientists to detect these planets that orbit stars outside of our solar system. That is why scientists need our help, because the more people that help them the easier they can understand and observe the data. I have been exploring exoplanets myself, because I feel that exoplanets is a very difficult topic and project to understand and study. I also think they are cool and interesting. I have also been showing images of exoplanets in the Space Visualization Lab (SVL) at the Adler to our amazing guests. If you want to learn and view more about exoplanets stay tuned for my next blog post. I hope you all enjoyed exploring teen blog posts about the astronomy and science that is interesting to them. To learn more about exoplanets you can visit all of the web pages and sites I have used while researching. Thank you once again! “Planethunters.org.” Planet Hunters. N.p., n.d. Web. 25 July 2014. <http://www.planethunters.org/classify>. “The MEarth Team.” The MEarth Team. N.p., n.d. Web. 25 July 2014. <http://www.cfa.harvard.edu/MEarth/Team.html>. “Planets Around Other Stars – NASA Science.” Planets Around Other Stars – NASA Science. N.p., n.d. Web. 23 July 2014. <http://science.nasa.gov/astrophysics/focus-areas/exoplanet-exploration/>. “Variable Stars (examples).” Planet Hunters. N.p., n.d. Web. 25 July 2014. <http://blog.planethunters.org/2010/12/28/variable-stars-examples/>. “Quiet Stars (examples).” Planet Hunters. N.p., n.d. Web. 25 July 2014. <http://blog.planethunters.org/2010/12/25/quiet-stars-examples/>. “Exoplanets.” : Science. N.p., n.d. Web. 25 July 2014. <http://exoplanets.astro.yale.edu/science/citizenscience.php>.